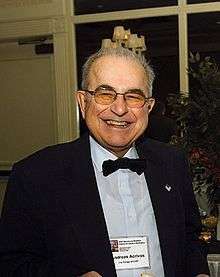 Andreas Acrivos (born 13 June 1928) is the Albert Einstein Professor of Science and Engineering, Emeritus at the City College of New York. He is also the Director of the Benjamin Levich Institute for Physicochemical Hydrodynamics. Born in Athens, Greece, Acrivos moved to the United States to pursue an engineering education. He received a bachelor's degree from Syracuse University in 1950, a master's degree from the University of Minnesota in 1951, and a Ph.D. from the University of Minnesota in 1954; all in chemical engineering. Acrivos is considered to be one of the great fluid dynamicists of the 20th century. In 1954 Acrivos joined the faculty at the University of California, Berkeley. In 1962, he moved to Stanford University where he helped Professor David Mason build one of the world's finest chemical engineering programs. In 1987 Acrivos joined as the Albert Einstein Professor of Science and Engineering at The City College of the City University of New York, a chair vacated by the death of renowned fluid dynamicist Veniamin Levich. Acrivos has been listed as an ISI Highly Cited Author in Engineering by the ISI Web of Knowledge, Thomson Scientific Company. ↑ Andreas Acrivos at City College of New York Retrieved 8 November 2008. ↑ "The apex of accomplishment". University of Minnesota. Archived from the original on 23 September 2010. Retrieved 8 November 2008. ↑ "1991 Fluid Dynamics Prize Recipient". American Physical Society. Archived from the original on 24 November 2010. Retrieved 25 April 2009. ↑ "G. I. Taylor Medal". ↑ "ISI Highly Cited Author - Andreas Acrivos". Archived from the original on 20 September 2004. Retrieved 17 June 2009.